It’s the second week of being the Sponsor Relations Intern here at the Blue Ribbon Foundation and I’ve already started dreaming about warm, delicious corn dogs at the fair. If I close my eyes long enough I can almost smell them. As far away as this fantasy may seem, summer is just around the corner and the fair is quickly approaching! This week I worked on the “Dining Delights” event portion for the 2019 Corndog Kickoff. The 23nd annual Corndog Kickoff Benefit Auction will be a fun-filled night complete with live entertainment, fair food favorites, and a variety of auction packages to satisfy any State Fair enthusiast. The Kickoff is the foundation’s largest fundraiser, with over 2,000 individuals in attendance last year. Because the inaugural Dining Delights gift card pull was such a resounding success, Kickoff attendee’s will have the chance to select a gift card at random again this year. Iowa restaurant gift cards with a $25 value or more will be featured in the gift card pull. To either donate a gift card get involved with the Corndog Kickoff, contact us through the blueribbonfoundation.org website or call us at (515)-262-3111. I look forward to this year’s Kickoff and hope to see everyone there! Let the competition begin! 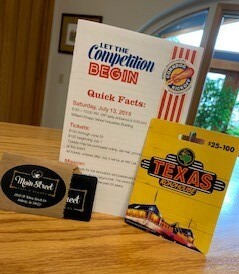 Thanks to Main Street Café and Bakery and Texas Roadhouse for participating!